The orbital flight-model Orion capsule pictured here will have to be repaired before its flight on a Delta 4 rocket in 2014. A crack formed in its aft bulkhead during recent pressure testing at Kennedy Space Center in Florida. WASHINGTON — NASA's first orbital flight-model Orion crew capsule will have to be repaired before its planned 2014 debut after its aft bulkhead cracked during recent pressure testing at the Kennedy Space Center in Florida, a NASA spokeswoman said Nov. 19. The cracks were discovered during a proof pressure test the week of Nov. 5. Proof testing, in which a pressure vessel is subject to stresses greater than those it is expected to encounter during routine use, is one of the many preflight tests NASA is performing on Orion to certify the craft is safe for astronauts, agency spokeswoman Rachel Kraft said. "The cracks are in three adjacent, radial ribs of this integrally machined, aluminum bulkhead," Kraft wrote in an email. "This hardware will be repaired and will not need to be remanufactured." Cracking occurred when the pressure inside the Orion module reached about 149 kilopascals, or 21.6 pounds per square inch, Kraft said. To pass the proof test, the Orion pressure module has to withstand about 164 kilopascals, which is roughly 1.5 times the maximum stress the capsule is expected to encounter during missions, she said. Increasing the pressure inside the craft in an ambient environment of 1 atmosphere — air pressure at sea level — effectively simulates the conditions Orion would encounter in a vacuum. William Gerstenmaier, associate administrator for NASA's Human Exploration and Operations Mission Directorate, speculated that a beam affixed to the bulkhead's cracked ribs by a pair of bolts "may have been a little stiffer than some of the models portrayed." To figure out what went wrong, "we'll actually cut out these cracks [from the bulkhead] and then we'll do a scan with an electron microscope," Gerstenmaier told members of the NASA Advisory Council's Human Exploration and Operations Committee. The group, which makes policy recommendations for NASA managers, met here Nov. 15. A team of Lockheed Martin engineers will perform the post-test investigation. 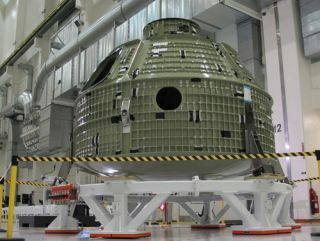 NASA is evaluating what effect, if any, the incident will have on Orion's scheduled late-2014 debut, designed to test essential systems on the vehicle including its heat shield and avionics, Kraft said. During that flight, which is known as Exploration Flight Test-1, an uncrewed Orion will be launched to orbit and re-enter the atmosphere at about 32,000 kilometers per hour, or roughly 80 percent of the velocity the capsule would reach during a return from lunar orbit. Lockheed is running the flight test for NASA; the agency will pay the company for the flight data. Lockheed Martin's Orion prime contract, awarded in 2006, is worth $6.23 billion. NASA added $375 million to that award in December so that Lockheed Martin could buy a Delta 4 Heavy rocket for the Exploration Flight Test 1 launch. Gerstenmaier said in a July hearing that the pacing item for this test flight is the Delta 4, built by United Launch Alliance, Lockheed Martin's 50-50 joint venture with Boeing Defense, Space and Security of St. Louis. The rocket would not be available until September 2014, Gerstenmaier said at the time. Delta 4 is not Orion's primary carrier rocket. NASA is building the massive Space Launch System rocket at the Marshall Space Flight Center in Huntsville, Ala., to loft Orion on missions beyond low Earth orbit. The space shuttle-derived Space Launch System is slated to launch the Orion capsule on missions that will take it around the far side of the Moon in 2017 and 2021. Only the second of these flights will be crewed. While NASA is internally studying other Orion missions, the agency has identified funding only through the 2021 flight.